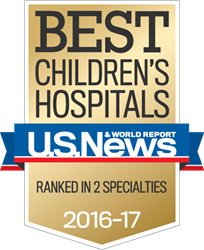 U.S. News & World Report announced that it has ranked Wolfson Children’s Hospitals in two specialties in the new 2016-17 Best Children’s Hospitals rankings. The U.S. News Best Children's Hospitals rankings are just one way to help parents determine where they can get the best medical care for their children. Wolfson Children’s was ranked 46th out of the best 50 children’s hospitals in the nation for gastroenterology and GI surgery, and 48th out of 50 in pediatric neurology and neurosurgery. Services provided at Wolfson Children’s Hospital are provided primarily by pediatric physician specialists with Nemours Children’s Specialty Care, Jacksonville, and the University of Florida College of Medicine – Jacksonville. What does U.S. News’ ranking mean to parents and patients? “The Best Children’s Hospitals highlight pediatric centers that offer exceptional care for the kids who need the most help,” said U.S. News Health Rankings Editor Avery Comarow. How does a children’s hospital get ranked in the top 50? U.S. News & World Report began ranking children’s hospitals in 2007 on their ability to help children, particularly those with rare or complex medical conditions such as cancer; congenital heart disease; diabetes and metabolic disorders; brain, spine and nervous system conditions; diseases of the digestive tract and more. One-third of each hospital's score relates to survival, infections, surgical complications and other medical outcomes. Hospital reputation, based on an annual survey of pediatric specialists and subspecialists in each of the 10 specialties, makes up 16.7 percent, or one-sixth, of a hospital's score. The remaining 50 percent evaluates a hospital's commitment to safety, excellence and respect for patients. A few examples of these might include a count of specific ways in which a hospital minimizes infections, the number of fellowship programs offered and the extent to which families are involved in a child's care. Parents and caregivers have to decide for themselves whether they want to put more or less weight on particular factors, said U.S. News on their website. For more information on the U.S. News rankings, visit Best Children’s Hospitals and use #BestHospitals on Facebook and Twitter. Wolfson Children’s Hospital relies on the generosity of members of our community. To support Wolfson Children’s Hospital, please visit wolfsonchildrens.org/waystogive.